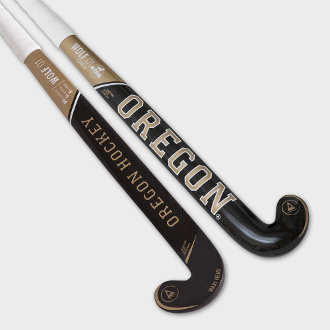 The Oregon WOLF1 field hockey stick is black and golden. It offers a lowbow specifically designed for a greater level of ball control and amazing 3D skills. It produces incredible power and speed. Composed of 90% carbon, 5% Kevlar and 5% flax fiber that make it extremely rigid, it is recommended for experienced players. The WOLF is a first choice stick for top level hockey players and Oregon’s flagship model. It is an innovative hockey stick specially designed for strikers.